The biggest final product of the project is the collaborative group magazine. 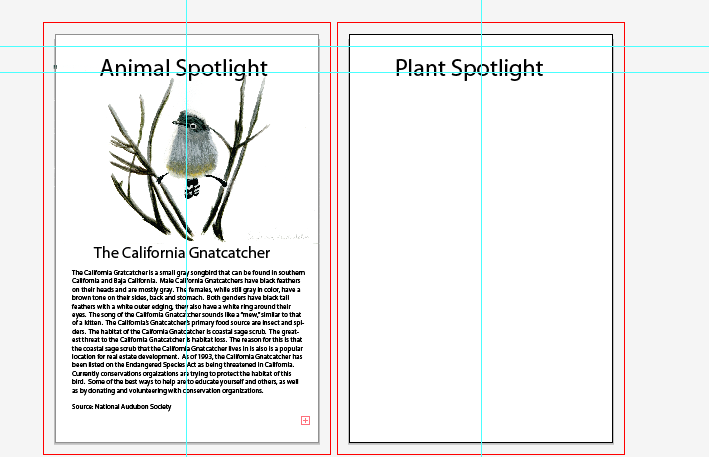 In the magazine we will include interviews conducted by group members, How to's, life cycles of local species, nature spotlights and articles about the effects, both positive and negative, about life on in the Carlsbad watershed. With one of my partners we have been editing the magazine and have acted as creative directors by choosing the articles and segments we want to include. We are still in the development stage but we have multiple pages laid out and have many articles done. So far we have started a couple pages and finished three single pages (Not including the covers). These pages include a segment we want to do called "Local Spot Light" where we write a small article about the species and provide an illustration. (For the Plant Spotlight we are looking into the Taco plant (Laurel Sumac). Another Segment will be our "How to's". Right now only one is finished, but we plan to fit all of them in. We will discuss and finalize the size of each when we have all the components to the magazine. For the moment the "How to" we have is shown on a full two pages. 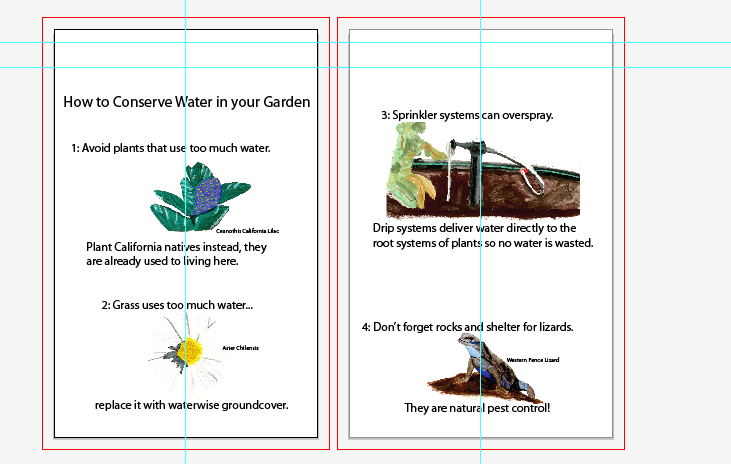 Another set of pages we have finished designing are the front and back cover. We took this page into consideration because it is the initial page most people will see. We wanted to use original pictures of the watershed we are studying, the Carlsbad Watershed. We used one of my partners pictures for the front cover and one of mine for the back cover, this provided original pictures of the real area without the hassle of finding a picture, contacting the photographer and getting the permission from he or she for the magazine. After we had the pictures we found a quote that portrayed the message we wanted and then put in on back cover using a handwritten font that we also used for the front. After much work for so many weeks, I was unable to update this page weekly. But I have all the final pages to show and explain. 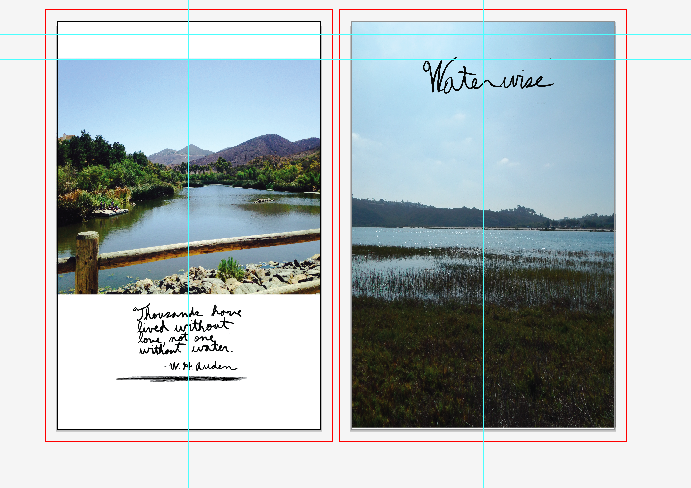 For the past few weeks I have been working on and revising my watershed magazine. Here are the separate parts I contributed to them. In the farmlands of the San Pasqual valley there is a man, known only as Kurt Euhus. This man is a small-time farmer with a big-time impact. He is setting an example for environmentally-friendly, water wise irrigation methods that create no runoff but still provide enough water for crops. This method is made possible by the use of Micro/Precision Irrigation. S.V: How did you begin your career in farming? K.E: My College degree is Agricultural Economics, so when I went to college I was looking at being involved in the Business side of Agriculture. SV: What lead you to pursuing that? K.E: Growing up in a community of farming I had a lot of friends that were farmers and I had worked on farms before. My Grandfather farmed and it was something I really wanted to be involved in. SV: So recently you changed your crop from avocados to Grapes, why? KE: Because of the water use. We are on a water district, so the water is expensive, and grapes use a fraction of the water that avocados require. SV: So, this is your primary job and not a side project? KE: Because we only have two acres of production ground we are considered a “hobby” farm. KE: I have timers, so it is all automated. I base my water use, or how much i'm going to put on, by going to simis, a website through UC Davis, and it gives you the estimated evapotranspiration for particular days and I do mine based on a week so I look at it for that past week and basically you have to replace the water that the plant: 1. used and 2. what was evaporated through transportation. So this website says “this is what the ET (Evapotranspiration) was for these days” and you add that up and go to a website where they give you the coefficient to an avocado tree and you enter information like: how many sprinklers per tree, what the volume is and it tells you how much water you need to put on to replace the water you just used. And thats how I base how long I’m going to water. Since I only have two acres and in those two acres we have a lot of different soil types I set up irrigation zones to correspond with this because whether your soil is soft or hard then that changes the way you water, so how often and how much. So to measure this we use these things called tensiometers and we put those in the soil and it tells you how hard the soil is holding the water for the tree. Once it gets to a certain point the tree can’t pull it out of the soil anymore. SV: In how many areas of California have you farmed? KE: Just in the San Pasqual Valley, I used to work in sales for an irrigation manufacturer, where we created and sold micro-irrigation, and my territory was Southern California and the midwest all the way up to the great lakes, so I have seen many different farms, different crops. I wasn’t growing, I was selling but I saw a lot of different stuff. SV: So how did the land managing go into the irrigation sales, keeping in mind runoff and things of that nature? KE: Micro-irrigation, that was one of our selling points. You’re putting that water right where it need to be in small amounts, easier to control. Say if you have the big sprinklers then you're just spraying, flooding a field, you have less control over where the water actually goes, especially outside of where it floods. So the selling point was that the product didn’t create waste, didnt have runoff. Anyone now, because water is so expensive, doesn't want to see it (water) running off. You just feel like you’re wasting, burning $20 bills. So I do have Micro-sprinklers on my trees, so we just put water right where it need to be, keeping water within the root zone of a tree. So if water is running off on in one of my locations its that a line is broken because we have risers and stuff so we just fix those and we should be fine. So they (The water district) just changed the rules, and they won’t have concrete ones until 2015, so as far as wasting water in specific watersheds I don’t have the exact regulations at the moment. They regulate it because of the things getting into the runoff that goes into the watershed like the nitrates and sediments. But so far they haven’t found anything so everyone is doing what they are supposed to be doing, of course we haven’t had any rain so its really hard to measure at the moment. SV: So since you live on a hill are there any specific irrigations methods you use? SV: Do you use any pesticides that could potentially seep into waterways? KE: No, I use no pesticides and instead use a fertilizer. But I can tell you that there are government agencies that do keep an eye on that in every water district. But a way I do try and prevent runoff with the fertilizer is that I use it all year. Most people put it in once a year giving enough fertilizer for the year which leaves it more vulnerable to leakage into the waterways. SV: How has the drought affected what you can and cannot do? KE: Can or cannot is more of, can or cannot afford. The water is getting more expensive as it goes on. I do wish we were on a well. With our own water. The energy cost would be higher but the water would be a lot cheaper, even if you have to dig a little deeper for the well. SV: How much does Irrigation cost you per year? KE: Last month's water bill was $537. And that is for September which would typically be a higher month so June, July, August, September would be around there. So year round with just avocados it would be around 7-10 thousand. And with the drought the cost is constantly going up. SV: Thank you so much for your time. Another mini-project I had during this magazine project was taking and providing photographs of our local watersheds during field trips and hikes for the magazine. In the end there were many that were not chosen to be in the magazine but here is a gallery for all the images captured for the Waterwise magazine. After this I had an active job in helping format and creating logistical and interactive pages for the magazine using Adobe Illustrator. I created the Table of Contents and the word search. After I did this I converted all the files of the pages into different picture formats, combined them and turned them into a PDF, revised and made corrected spelling and grammar errors and finally, personally turned it in to be published. Below I will include a slide show of images showing the magazine pages and the link to view the published magazine. Overall this project was incredibly fun even while dealing with the creative differences we had in the formatting. Eventually I gave the ultimate format approach to the group member who knew Adobe Illustrator the best. Our final artistic approached to the magazine is a simplistic, academically driven style that show cases our work without having any distractions in the magazine.